Radial profile of W Aql derived from SCUBA-2 850μm observations (Dharmawardena et al. 2018). 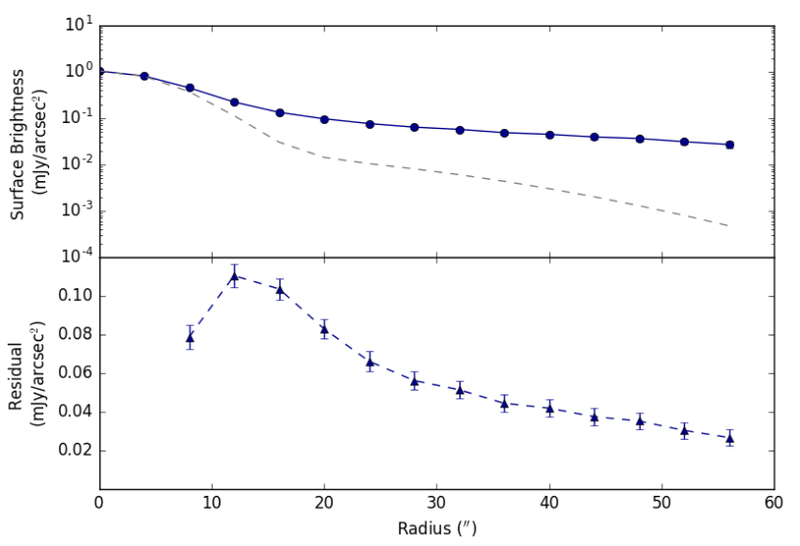 The lower panel shows the residual after subtracting a point-source profile (the SCUBA-2 beam, Dempsey et al 2013) from the observed profile. The resulting profile corresponds to a lower limit on the extended component of the sub-mm emission. Distance vs dust production rate (DPR) for the NESS sample. Each colour corresponds to a different sub-sample in mass-loss rate. Near the end of their lives, low- and intermediate-mass stars ascend the Asymptotic Giant Branch (AGB), becoming extremely luminous and ejecting a large fraction of their mass in a dusty wind. The Nearby Evolved Stars Survey (NESS) targets a volume-limited sample of mass-losing AGB stars within 2 kpc of the Sun to derive the dust and gas return rates in the Solar Neighborhood, and constrain the physics underlying these processes. AGB stars have long been assumed to be the main contributors to the interstellar dust reservoir, but recent observations of significant dust mass at high redshift have cast doubt over that assumption, and it is therefore important to properly quantify both the interstellar dust mass in galaxies, and the dust production rate by AGB stars. In the last decade, much work has been done on nearby galaxies, such as the Magellanic Clouds, but a good quantitative analysis for the Milky Way itself is still lacking. With this ambitious program we aim to fill that gap in our knowledge, exploiting newly available Gaia data, taking a multi-pronged approach. With the JCMT in the North and APEX in the South, we will observe our sample in 850 micron continuum emission, thus extending the infrared spectral energy distribution to the submm, allowing us to detect the coldest dust tracing historical mass loss. Second, we will target our sample in the CO(3-2) and CO(2-1) transitions to determine the gas mass loss rate. A subsample of nearby targets will be mapped in both continuum and CO lines, making it possible to resolve variations in the dust mass-loss history and gas-to-dust ratio. We will also observe selected bright targets in the 13CO (2-1) and (3-2) lines to measure the 13C/12C ratio. It remains very challenging to systematically measure CO gas mass-loss rates outside the Milky Way, and NESS therefore represents our best chance to derive properties like the gas-to-dust ratio in stellar outflows, as well as characterize the physical conditions in the outflowing dusty gas, in the near future. 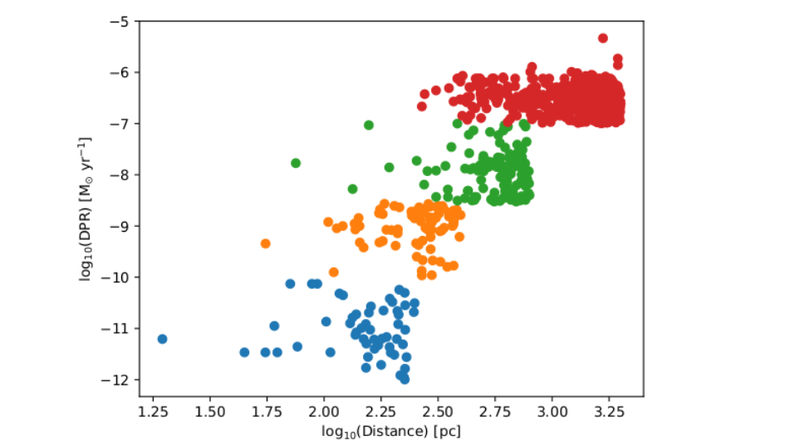 The sample is divided into four mass-loss rate bins over 6 orders of magnitude, with similar numbers of objects per bin. High mass-loss objects are rarer but more luminous, and the sample will therefore be complete out to 2 kpc in that bin. In the lowest mass-loss rate bin we can only observe objects in the direct vicinity of the Sun, out to 250 pc. Measuring the 13C/12C ratio will provide constraints on existing nucleosynthesis models. Further science goals include the detection of non-sphericity of the circumstellar environment; the determination of the outer radius of the CO emission, which is set by the CO dissociation due to the interstellar radiation field; and correlation of the dust mineralogy as detected in the mid-infrared with the mass-loss properties.